The Narva rechargeable cordless lamp. 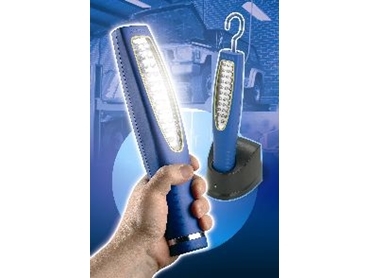 THE continuing evolution in LED lighting is clearly apparent in the latest release from Narva, represented in Australia by Brown & Watson International Pty Ltd .
Narva has used innovative ideas coupled with the latest LED and battery technologies to produce a versatile, rechargeable inspection lamp that will have a multitude of applications in workshops and garages. The Narva rechargeable cordless lamp (SeeEzy) uses 30 high intensity LEDs, each with 100,000 hours of life, to deliver more than six hours of continuous operation before recharging via a convenient docking station charger. This allows operators the freedom to take the light anywhere. The high intensity LEDs and a highly polished reflector enhances the light output and delivers a very even spread of light. Housed in heavy duty rubber with a weather resistant shatterproof polycarbonate lens, the lamp is resistant to oil and grease, making it ideal for use in workshop environments. With robust construction plus the avoidance of hazardous leads and compliance with EMC and electrical standards, the lamp provides great Occupational Health & Safety benefits for any busy workshop. The latest NiMH battery enables the light to be used and recharged after long or short periods of use without creating a restricted charge memory. When the battery capacity is low, a red LED indicator is activated within the lamp. At that point the light is inserted into a convenient wall or bench mounted 240V ac charger docking station, incorporating a green LED indicator to show when the unit is fully charged. For convenience and ease of operation, a sealed switch is built into the back of the light and a replaceable fold-away swivel hook is integrated into the housing.